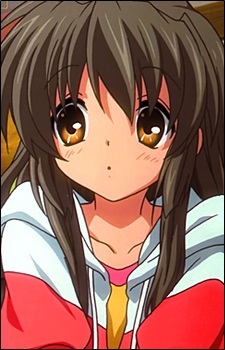 Birthday: 7/20 Constellation: Cancer Blood Type: B Height: 150 cm Bust: 78 cm Waist: 54 cm Hip: 79 cm Weight: 43 kg Favorite animal: Starfish Fuko is a first year student at Tomoya's school (Technically, her age is same as Tomoya's), but she is always alone by herself, making wood carvings of starfish with a small knife to give to others as presents for her sister's upcoming wedding. Whenever Fuko sees something she thinks is incredibly cute she completely loses awareness of her surroundings, which Tomoya takes advantage of by playing a variety of pranks on her. It is later found that Fuko is actually in the hospital, still in a coma from a car crash. Everyone slowly starts to forget her when her health condition gets worse. Tomoya and Nagisa were the last to forget her since she spent most of her time with them. After accidentally releasing one of the light orbs, Tomoya unwittingly brings Fuko out of her coma. She has no memory of what happened, but her personality hasn't changed one bit. She is extremely fond of Ushio.